I have a launch window for Eeloo coming up in 39 in game days, so I'm preparing three relay satellites for launch to the frozen dwarf. These sats all have 36 Nuks and 7000 battery storage, but I still feel compelled to outfit them with 5 or 6 gigantor solar arrays. Satellite just don't look/feel right without them. Does anyone else include useless solar panels on extreme deep space craft? Heck yeah, I'd keep gigantors at 4 and add a fuel cell array. Solar panels are fine everywhere unless you use ion propulsion, when they become useless basically past Dres. When I sent a SCANsat satellite to Eeloo I was afraid that I messed it up when I forgot to add any rtg's. I was wrong. Four gigantors made it to work just fine. No issues as long as the satellite stays out of shadows. Solar power seems to be useful in all areas of the Kerbol system. Solar power works fine at Eeloo, its a similar distance from the sun as Jool... which is proportionately as close to the sun/solar power is just as good as solar power is in real life at Jupiter. In real life, Solar power has been used at Jupiter, although Gallileo was RTG powered. It's also worth noting that relay satellites require virtually no power. As long as you have enough power to keep a probe core running-- which you can get from a single RTG-- that's all they need. So unless you have some power-hungry process like ISRU refining or science lab research going on, you can just stick a single RTG on the satellite and you're done. In my own gameplay, I tend to optimize for mass-- i.e. the smallest, most lightweight ship that gets the job done. At Jool and beyond, kilogram for kilogram an RTG does a better job than a solar panel (especially if you're using Gigantors, whose mass-per-watt is significantly worse than the smaller panels). 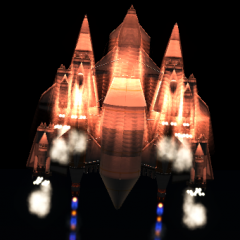 So for those outer-system missions, I generally just put an RTG on it and call it done. If I have an outer-system mission that uses drilling or refining, which are heavy energy hogs, then I use fuel cells for that, since they're high power, and the drilling/refining process provides the LFO they need. About the only high-continuous-electricity application that isn't covered by this strategy is having an actively researching science lab. However, since I never use the science lab for any researching ever (because I find it game-breakingly overpowered), that doesn't come up for me. If it did, I guess I'd either need to spam RTGs (and be willing to foot the enormous bill for that), or else include ISRU capability and have it run off fuel cells. yes, but they are not useless, they will give your ship power. Most of my unmanned stuff - survey, comm relay & science sats - are made to go anywhere, so they typically have some solar & a small RTG or two. I can't remember which mod it's from, but I have a small, low-cost & mass RTG that puts out ~0.1 ec/s, looks kinda like somebody cut a slice off the top of a stock RTG. I stick them on just about everything once they're available, but still hang on to at least a pair of 1x6 panels. Now once I start getting into ISRU, I tend to build for wherever they're going, and don't waste mass on solar if they're going far too far out. I'll just stick with RTG's for routine power & fuel cells or nuclear/fusion reactors for the drills & convertors. especially if you're using Gigantors, whose mass-per-watt is significantly worse than the smaller panels). So for those outer-system missions, I generally just put an RTG on it and call it done. So in the end, if re tractability matters, they are the best. Also for many applications where you're not free to orient your craft in any direction, multiple small panels will end up occluding each other. They are somewhere between the small retractable and non retractable panels. They retract but are still more vulnerable to breaking than the small retractable ones, and they are less heat tolerant, but more so than the small non retractable ones.